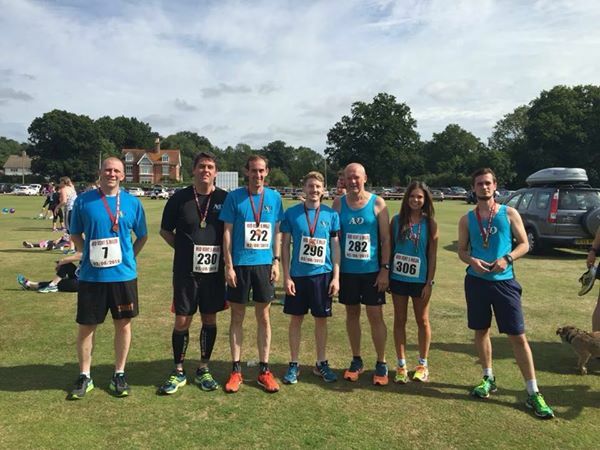 Set amongst the picturesque Kent countryside around the country lanes in Staplehurst, Sunday saw perfect weather conditions and a record field in the 8th running of the Mid Kent 5 miler. First home for the club was Chris Boyce who finished in the top 10 with a 7th place finish in a time of 29:58. Keith Haynes was next home as he Pb’d in 28th place in a time of 33:44. Anthony Brown was close behind in 33rd place in a time of 34:26. Rhian Shrimplin was 2nd in her age category as she finished in an excellent time of 37:38. Stuart Nunn running his first race for the club came home in 40:32. Next in was Steve Hickman who finished 10th in his age category in a time of 40:52. Simon Jackson came home 25th in his age category and a new Pb in a time of 44:32. Andrew Smith continued his fine form as he Pb’d in a time of 45m:42s.